“In the beginning was the song and the song was good”. I make no apologies paraphrasing the bible. Song and music has been the bedrock of ancient civilisations and religions up until the present day. When mankind had a celebration or commiseration, chanting & dancing were integral. From the cave dwellers worshipping the animals of the forest to the Plain Song of Pope Gregory, evolving into the more sophistication performances we enjoy today. The adult school movement started in the late 1790s and grew from small beginnings to be a major influence in education. In the early days it was probably to encourage people to read the bible, and as a significant number were illiterate this was broadened to include education in more diverse ways for the “Working Man” Women were not considered to be worth spending the time being educated, a view that was due to change! The movement spread especially in Wales and Scotland. Here in Birmingham it should be noted that Joseph Sturge and William White – were instrumental in leading the way with Adult schools. (see also below) led by members of the Society of Friends. It had evening classes in arithmetic, geography and grammar.Other activities were included - painting, leatherwork and music. 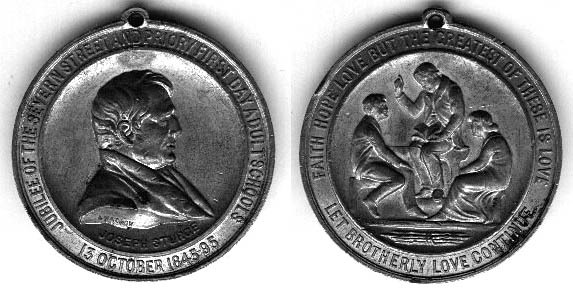 In 1895 a medallion was issued to commemorate it's 50th Anniversary. Not known if this is the school that Joseph Sturge started the Adult Class. had greatly increased by the part which they had taken in Adult School work. he became a teacher at the Early Morning School attached to the Church of the Messiah (founded by George Dawson) in Broad Street. When he became a national figure ("Brummagem Joe" as he was later nicknamed), his busy career as a politician did not prevent him from keeping in touch with many of his Adult School associates. Cadbury Brothers in 1866 saw a turning point for the company with the introduction of a process for pressing the cocoa butter from the cocoa beans. This not only enabled Cadbury Brothers to produce pure cocoa essence, but a plentiful supply of cocoa butter remaining was also used to make new kinds of eating chocolate. 1860 The Birmingham Mint in Icknield Street was founded. was active for many years in the temperance society. Alcohol was perceived by him to increase poverty among the working people. With his son George Cadbury, b 1838 – 1923 who was a teacher in the adult school movement they taught hundreds of men to read and write between 1849 and 1911. 19th century who was the person who wrote the first History of Birmingham in 1783. Photo acknowledgement Mac Joseph "Old Ladywood"
The school is now a Sikh temple and has suffered a fire in recent years but has now been repaired. 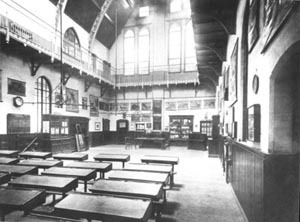 The school opened in 1883 (J.H. Chamberlain's death), as Icknield Street Board School. It became a secondary modern in 1945. 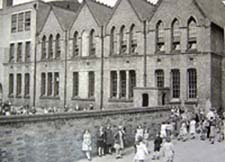 In the 1960s it had over 950 pupils, believed to have closed in the 1970s. 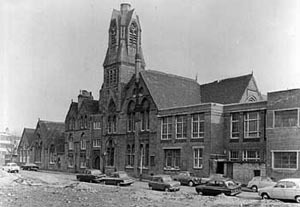 It is one of Martin and Chamberlain's Board Schools - Board Schools more, and is listed Grade II, and they built another 40 of them around the city, also NELSON STREET, and STEWARD STREET, and OOZELLS STREET. They were built with certain aims in mind, e.g. healthy ventilation and that is why they had towers, to allow air circulation, as the classrooms show here. 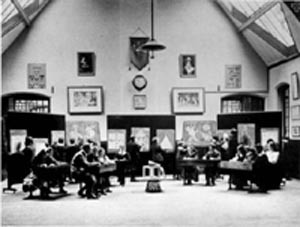 ART CLASS, and INTERIOR VIEW. Martin built in red brick with terracotta decorations in a Venetian Gothic style and used decorative tiles with foliage motifs, as also can be seen at the Birmingham Institute of Art and Design in Margaret Street, J H Chamberlain, is buried at Key Hill Cemetery. 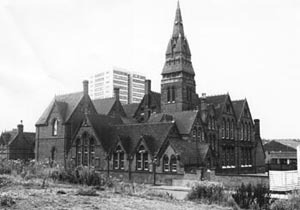 (as is Joseph Chamberlain no relation), they also extended the Grand Hotel and designed the original 1879 Central Library which was demolished in 1974. John Henry Chamberlain had formed a partnership with William Martin in 1864 and they became the leading gothic architects in Birmingham. Their offices were located in the Christ Church buildings (now demolished) at the top of New Street, close to the Town Hall and Council Buildings in Victoria Square. Chamberlain was also responsible for scores of Birmingham buildings including Spring Hill Library, just up the road, and Joseph Chamberlain's home Highbury Hall, as well as the Chamberlain Memorial Fountain. On the email link below, please click and edit. This is to deter spammers.